KnowBe4’s new game-changing partnerships with The Security Awareness Company, Securable.io, Popcorn Training, ThinkHR, exploqii, Canada Privacy Training, Twist & Shout, TeachPrivacy, and Syntrio allows you to significantly better manage the ongoing problem of social engineering. In your fight against phishing and ransomware you can now deploy the best-in-class phishing platform combined with the world's largest library of security awareness training content; including 850+ interactive modules, videos, games, posters and newsletters. Want to see all our great security awareness training content? It’s easy! 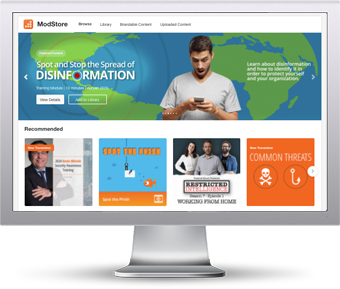 You can now get access to our ModStore Preview Portal to see our full library of security awareness content. You can browse, search by title, category, language or content topics. I want to see the ModStore!